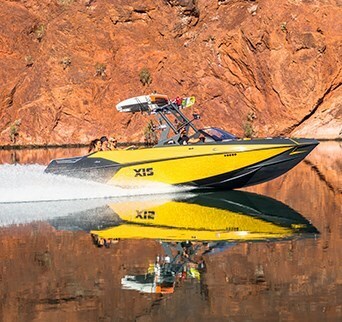 Axis Wake Research® of Loudon, Tennessee, is an independent line within the Malibu boat family. 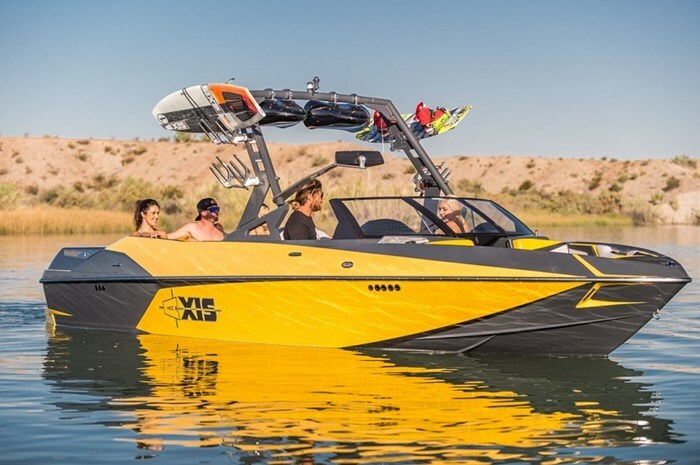 Axis offers “High performance, price-point wakeboard boats that bring new levels of quality, performance and style to the entry-level boat market.” The Axis T23, subject of this review, is the latest addition to the 2015 five model Axis lineup of inboard wake/surf boats ranging from twenty to twenty-four feet. The T23 is a follow-up to the T22 which was introduced last year and is the only other “traditional-bow” model. The other three models have more of a “pickle-fork” style bow design. 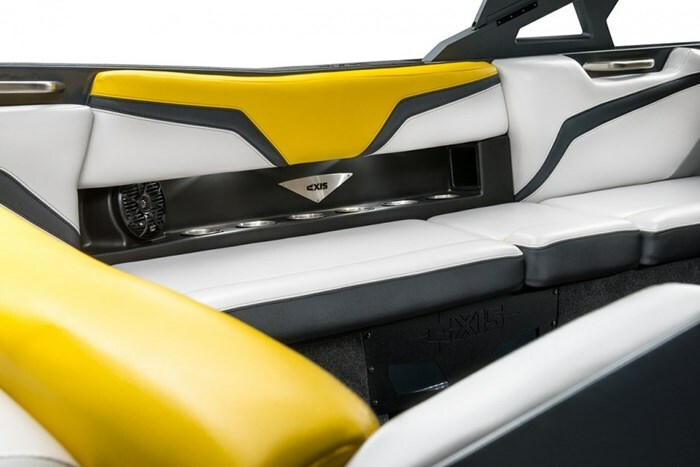 Created in 2007, Axis designed its boats to target, “The family that wanted to be on the water with a great looking, great performing boat, but did not want or need the advanced electronics and cosmetic “bling” found in the high-end boats of the day.” At 23 feet, five inches, the T23 is a full foot and a half longer than the T22 and has a seating capacity of sixteen persons versus fifteen for the T22. The T23 rides on the Axis “wake-and-wave-maximizing” hull design with a standard single shark fin and featuring a Wakebox hard-tank Hi Flo ballast system with a capacity of 1,000 pounds of ballast water. Standard power is provided by a 350 horsepower catalyzed 5.7L Monsoon 350 inboard engine with a 1.72:1 reduction gear ratio V-drive. With a full eight foot, six inch beam and what Axis calls a “cab forward” design where the centre opening windshield and helms are located further forward, the cockpit seating area in the T23 is indeed commodious. SkyBox slide seating is standard on all models and from the upholstered padding on the passenger helm acting as a spotter’s backrest, full surround, sectioned bench seating extends aft along the port side, across the transom and forward on the starboard side right to the back of the driver’s adjustable and swivel bucket seat. Storage is found below all of the seat cushions and LED storage lighting is standard. A double-wide transom sunpad features an aft notched step pad for easier access to the water-level mounted partial swim platform with mat surface. New for 2015 on all models is an above engine warming bin with drain. Bow seating is fully padded throughout with full surrounding back and side bolsters and storage beneath the seat cushions. The T23 features the new Axis-built AW15 hinged-base tower as standard equipment. 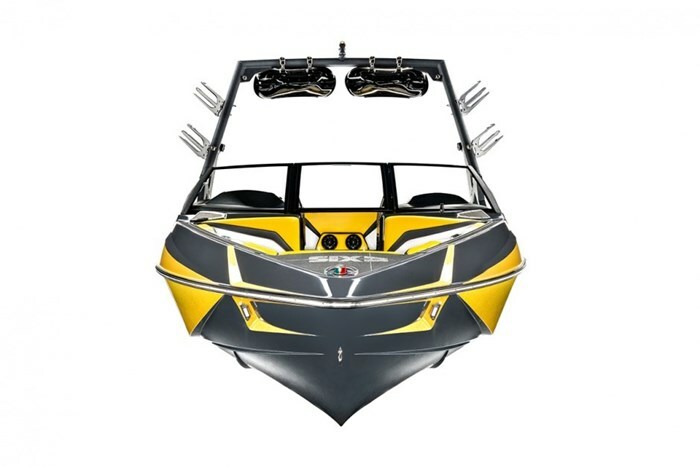 It is available in black, white, or charcoal to coordinate with fifteen basic hull colour choices or ten metal flake choices including three new choices for 2015 or go all out with the Liquid Force Edition graphics and gelcoat package. From the above basics, you can option your T23 to look and to perform to suit your watersports desires. Three upgraded Monsoon engine choices are available in 6.0L, 410 or 450 HO horsepower or in 6.2L, 550 supercharged horsepower. To the AW15 tower, you can add a new design bimini or surf bimini both with integrated rope storage pouches, the new design Z5 cargo rack, swivel or fixed wakeboard racks, a tower mirror bracket and a 140-degree PTM panoramic mirror. 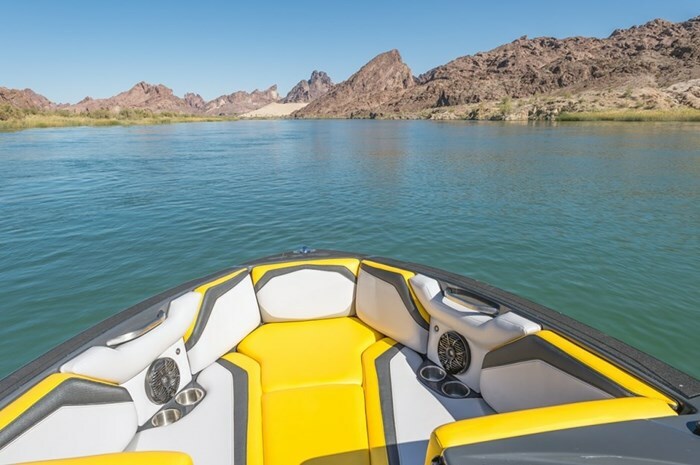 Standard engine instrumentation along with speed control and silver and black Livorsi controls are standard, but you can add Zero Off GPS speed control with compass and a depth finder. In the performance category, you can choose Plug ‘N’ Play for your ballast plumbing, high altitude or torque propeller, a surf pipe extension, an Auto-Set wedge, and best of all, the Axis Surf Gate®. With the Surf Gate®, wave creation is controlled with the flip of a switch allowing the driver to instantly generate the desired wave on the surfer’s side of choice. Simply drop the Wedge down, engage Surf Gate® and start surfing. And the surfer now has the ability to transfer from side to side. In addition, you can rapidly transition from surfing to wakeboarding and back again and from beginners to experts. Other notable options include red, white, or blue LED under-seat lights, underwater lighting, docking lights, portable Igloo cooler with dedicated storage, dual Chillax seats, removable AquaFusion carpet, 3-outlet heater, battery charger, PTM 140-degree panoramic windshield mounted mirror, automatic fire extinguisher, ski pylon, second shark fin, and a custom boat cover.